Termites are perhaps the most dreaded non-poisonous, non-disease carrying insect pests in the U.S. Every year, many millions of dollars is spent to repair structural damage to homes and businesses caused by these voracious pests. Two major species, the Eastern Subterranean and the Formosan termite, are sources of costly infestations for the unwary South Carolina building owner. Titan Termite & Pest Control offers termite inspections, as well as termite treatment, to commercial and residential locations throughout South Carolina. Contact us today. Living underground and difficult to trail, termites can often establish an infestation near or under a home or business without an owner’s knowledge. These colonies are beyond the owner’s ability to combat. Only professionally trained, experienced professional pest control technicians can handle this task. A property homer should obtain a professional termite inspection as soon as, or even before, observing evidence of pests or damage. A professional will do a thorough inspection that extends beyond the exterior foundation to include crawl spaces, sub-floor areas, basements and attics. If present, outbuildings, fences and wooden landscaping will be included. After inspection, a detailed written report on the areas inspected, termite activity found and recommendations for termite control and eradication will be provided. The methods and costs of these treatments will vary according to the building structure, the locations of infestation and their extent. There are two approaches to termite control and/or eradication. One option is the placement of liquid termiticide barriers in trenches dug around the perimeter of the property. Alternatively, poisons can be injected through rods inserted into the soil around the perimeter of any foundations. Finally, if necessary, treatment may include infusion of poison through holes drilled along expansion joints and cracks in a concrete floor. Because of these products’ combination of safety and effectiveness, profession pest controllers use water-based Termidor and Premise. Older, solvent-based products are no longer used. Termites must regularly return to their colony to obtain essential moisture and to feed the Queen and the young. 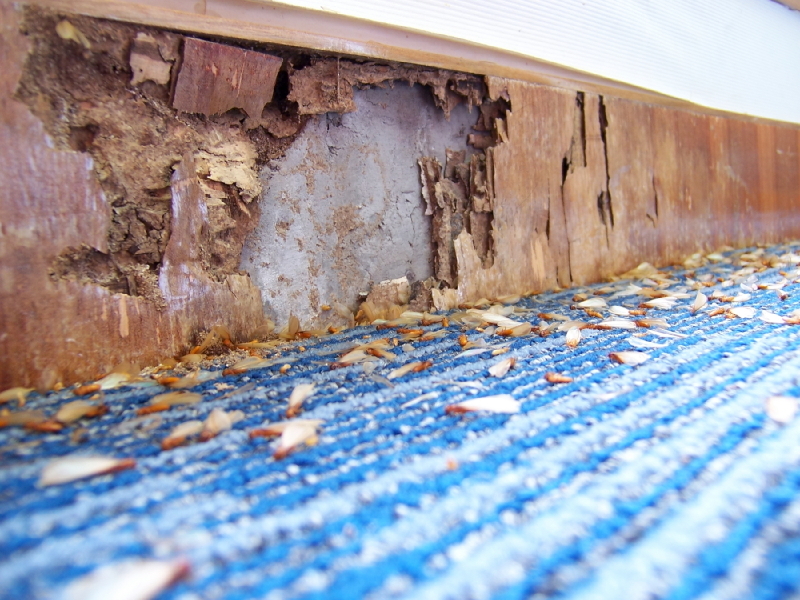 Termites will die during this travel or will carry the termiticide on their bodies and poison the entire colony. The second approach to termite control involves placement and maintenance of bait stations around the property. These reduce the termite population until the colony eventually dies out. These bait stations contain an insect growth regulator that spreads throughout the colony as the worker termites consume the bait. The hormone in the bait interferes with the termite molting process and preventing normal growth. Proper installation and replenishment of traps are important. The liquid and bait methods method have their pros and cons and differ in cost and effectiveness depending on the situation. Sometimes, initial liquid termiticide treatment is employed for an imitating effect. Baiting for termite eradication follows liquid treatment. In either case, only a professional can advise the property owner as to the best approach. Contact Titan Termite & Pest Control today to schedule a termite inspection.